You could correctly say the City of Selkirk has been preparing for this day for a long time so when the shovels went into the ground to signify the start of construction of the city’s largest subdivision in decades, it was validation the hard work was worth it. Vaughan Avenue West will feature more than 100 homes and be an extension of Vaughan that spans west from Annie Street. Mayor Larry Johannson said it’s an important day for Selkirk and it’s important to note it didn’t happen by chance. “I’m really proud to be standing here today to watch this new, exciting development start to take shape. Selkirk council and our administrative team have been working hard to let people know what a great place Selkirk is and we’ve been putting all the infrastructure in place so that we’d be ready for this day, when we break ground for a development just like this,” Johannson said. Chief Administrative Officer Duane Nicol said Vaughan Avenue West represents the future of residential growth in the city. Both council and city administrators have been drawing up the blueprint for sustainable growth in Selkirk for years and this development will be the template moving forward. Vaughan Avenue West fits with the city’s Strategic Plan and hits each of the plan’s five priorities – making Selkirk a vibrant, safe and healthy community, creating a strong and stable local economy, having safe and sustainable infrastructure, getting maximum value from community resources and being good environmental stewards. GRG Investments, the development team behind Vaughan Avenue West – a multi-phased subdivision featuring 104 single-family homes and two multi-family residences – are excited to be part of all the good things going on in Selkirk. Greg Crognali, Randy Bialek and Gerald Hawranik make up GRG Investments. Crognali said their vision for an inclusive community that offered ample outdoor space for families gelled with the city’s plans as well. 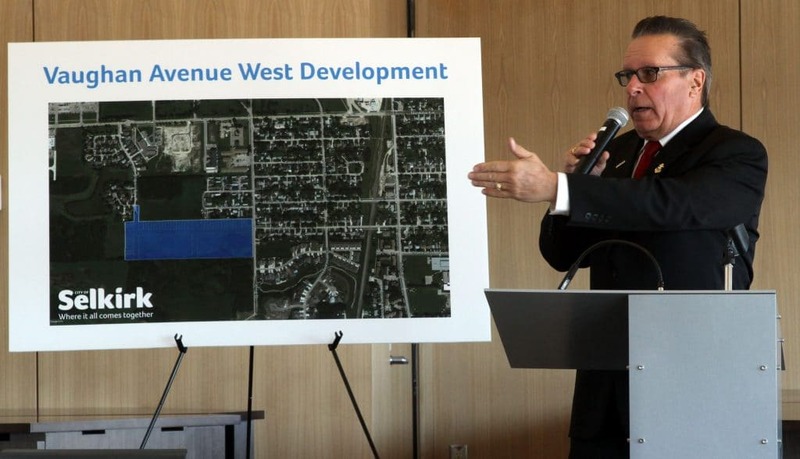 “We are thrilled to bring Vaughn Avenue West to Selkirk and pleased to have worked hand in hand with the city to design the project,” Crognali said. Nicol said he was pleased with the spirit of cooperation the city enjoyed with the developers, and called it a model for the kind of relationship they want to have with future developments. “These developers have been phenomenal to work with. Together we have brought a nice balance between the needs of this development and the needs of our overall community,” Nicol said. Vaughan Avenue West will be built in two phases. Phase 1, which begins today, will see the construction of 47 single-family homes and two multi-family lots. Homes will range from bungalows to two-storey and the multi-family lots will feature townhouse style and potentially apartment units, providing opportunities for renting as well. The community will be inviting in its outdoor spaces also, with landscaping that features trees, active transportation pathways and decorative street lighting. The city will put up just over $500,000 to extend Vaughan Avenue from Purvis Boulevard to Annie Street, with the developers paying the money back within five years, and perhaps even quicker if the development fills up faster. The extension is important Nicol says, for several reasons, including the fact it can reduce traffic on Manitoba Avenue by providing an alternate route for new residents and residents of the neighbouring Woodlands Court subdivision. The city is taking advantage of existing infrastructure by using the storm water management pond that’s already there, rather than digging a new one. The developer is funding mechanical improvements to the pond so it can be used for Vaughan Avenue West residents as well as dedicated over 2.5 acres of adjoining land for public reserve. The intentional planning includes infrastructure improvements done in recent years that, had that they not occurred, Vaughan Avenue West would not have been possible. The city added a secondary water source two years ago, made improvements to its water treatment plant and is currently constructing a state-of-the-art waste water treatment plant. “Again, it’s smart growth, we’re leveraging our existing infrastructure and adding enhancements to an adjacent neighbourhood,” Nicol said.